In case you haven't heard, Nordstrom recently began offering Dolce and Gabbana Beauty! Perhaps it is in my nature as a niche beauty blogger, but I absolutely love seeing my favorite niche brands expanding and breaking into big retailers like Nordstrom. 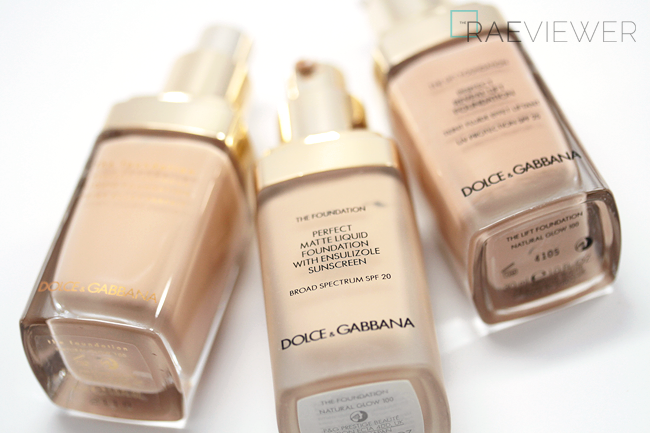 I spotted all the D&G liquid foundations on the Nordstrom website, and it immediately inspired me to share my thoughts on these three truly worthwhile formulas. Find out more about each foundation after the jump! 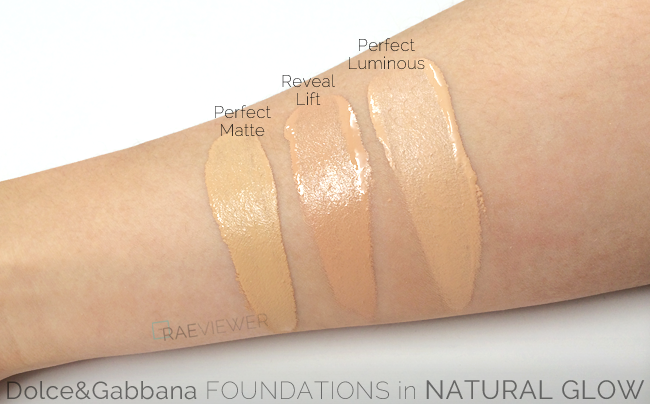 I use all three — Perfect Matte, Perfect Luminous, and Reveal Lift — in shade Natural Glow 100. Each formula's coloring varies slightly. 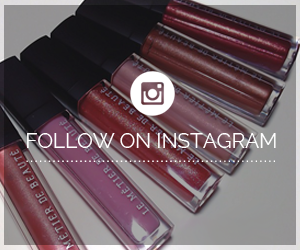 For example, Reveal Lift veers more orange-red while Perfect Matte is obviously yellow. Perfect Luminous in 100 is peach-toned. The Perfect Matte Liquid Foundation ($67 USD) was the first of the three featured here to launch and offers the most coverage (medium to full). Despite its name, the Perfect Matte formula has a soft matte finish and is suitable for all skin types! 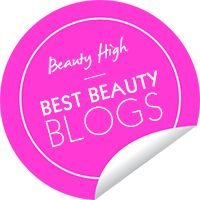 It just happens to be especially favorited by those with oily, combination, and shine-prone complexions because the special polymers used in the formula truly do live up to the claim of rub-resistant, 12-hour wear. The Perfect Matte hides redness as well as spots and provides a flawless complexion that looks beautiful and smooth all day long. I usually apply it with my fingertips, but I occasionally use a damp BeautyBlender sponge. 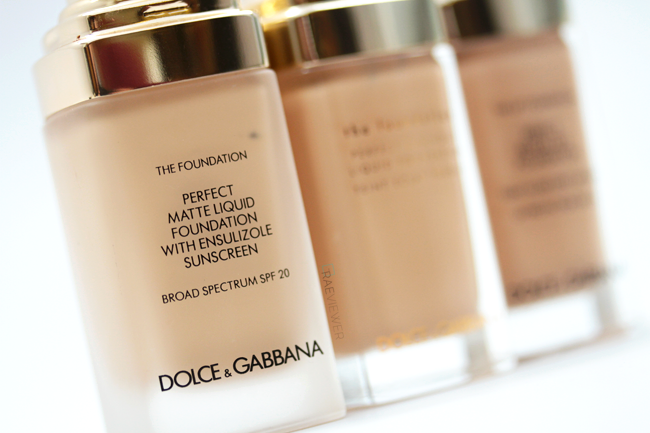 If you have very oily skin, do pair this liquid foundation with D&G's incredible Perfect Matte Powder Foundation for best results. The Perfect Reveal Lift Liquid Foundation ($72 USD) launched earlier this year, and beauty editors all over the world have been raving about its special skincare moisturizing properties. The formula is excellent for normal to dry skin, as it provides just enough coverage (sheer to medium) but feels ultra light. The finish is very dewy, which truly does make wrinkles less noticeable. I do not have any wrinkles, but I have seen the Reveal Lift on more mature skin, and it makes a remarkable difference! Since this foundation has a more fluid texture than the other two liquid foundations, it looks as close to "real skin" as possible and blends the most effortlessly (brush or fingertips). 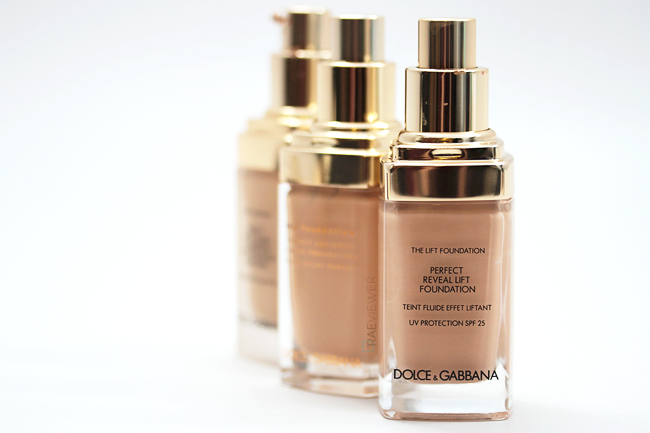 If you have very dry skin, try pairing the Reveal Lift with Dolce and Gabbana's new The Primer Makeup Base, an intensely hydrating, radiance-enhancing base. The Perfect Luminous Liquid Foundation ($60 USD) is my most recent acquisition. I have been wearing it for a week straight, and I quite like it for normal to combination skin! 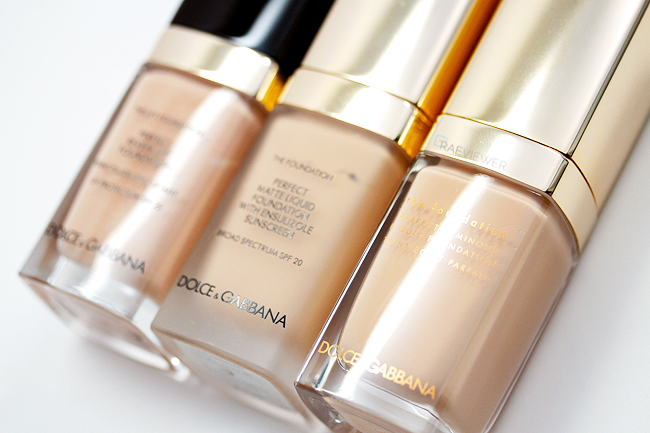 With two pumps, Perfect Luminous provides light coverage. With four pumps, however, I can achieve medium coverage. 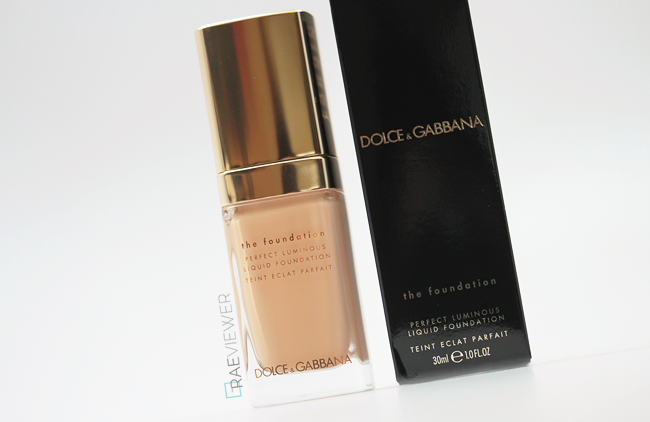 It provides more coverage than the Reveal Lift, and it has a softly luminous finish. It is not quite as dewy as Reveal Lift, which I prefer because my skin warms up the product and the finish glows more naturally throughout the day. On my normal skin, I can skip powder entirely. The Perfect Luminous formula is as modern, truly luxurious and silky as they come! If you have combination skin, finish with a loose powder or powder foundation for longer lasting results. but the Perfect Matte formula is still my favorite — even on my normal to dry skin! Hi Rae, I'm planning to order the DG Perfect Matte and I was wondering if I could use a brush to apply it, say with the Sigma F80, or with the Shu Uemura lightbulb sponge (damp)? 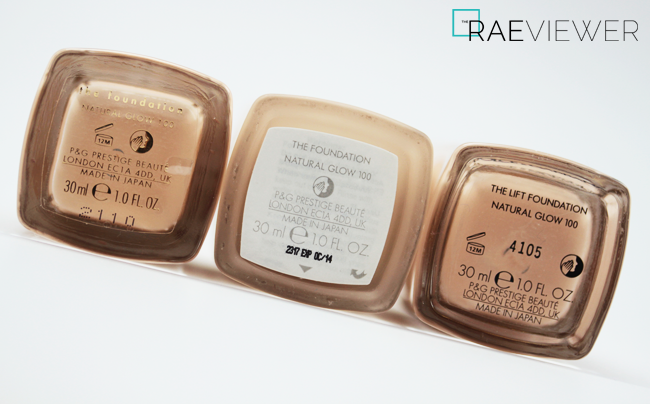 Would you say you prefer the Perfect Matte Formula or TF Traceless Perfecting Foundation? This or TF traceless or the Sisley one for dry skin and which does not accentuate pores/lines. Thanks.